The batter for these waffles needs to be mixed up the night before, but you'll be rewarded for your patience and planning-ahead-ness because the extra soaking time creates the perfect fluffy-on-the inside-but-crisp-on-the-outside texture. 2 cups Naked Oats (Rolled or Quick Cooking...anything works here because the oats will be ground up to a flour-like consistency anyways). If you are using hemp seeds instead of dairy milk, start with combining 1/2 cup hemp seeds with 2 cups of water in the blender. Blend and strain out the hulls. Measure all ingredients into a blender or food processor. Blend until the oats are chopped into a coarse flour and the remaining ingredients are thoroughly mixed. Let the batter sit overnight in the fridge. 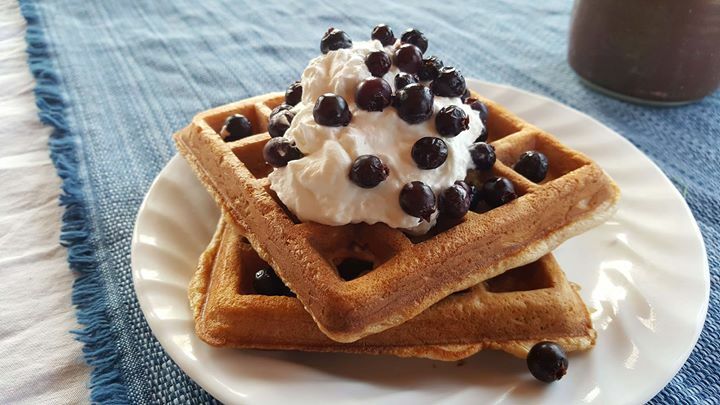 In the morning, heat up the waffle iron and give the batter a quick stir. Brush the surface with a bit of oil and pour some batter into the waffle iron. Cook until golden-coloured. If you're making a whole pile of waffles in advance to serve a crowd, spread them out on an oven rack at 200 C to keep them from getting soggy while they wait.